Join the discussion on our forums! Come discuss Rusty Recycler over in our dedicated Rusty Recycler discussion topic. Ironic. It could recycle others, but not itself. In my Mech Paladin it fits. I like to combine with a Missle Launcher. The AOE damage will heal you. Sure it hurts your own minions, but in my mech paladin deck, they are bug boys too. Extra good vs zoo. Descount the cost of mechs, combine in 1 as early as turn 8, and then rez him again. If they dont have hard removal its basically a game winner. Is it wall-e or is it number 5 from short circuit???? 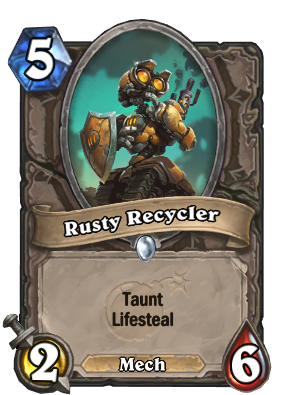 Did you ever hear the tragedy of Rusty Recycler? The flavor text is not something Team 5 would tell you about. It's a surprise to be sure, but a welcome one. I think this card is a underrated. 6 mana and you have a beastly magnetized taunt with lifesteal in paladin. It will work better than Felsoul Inquisitor due to the possibility of increasing its power with magnetic minions. 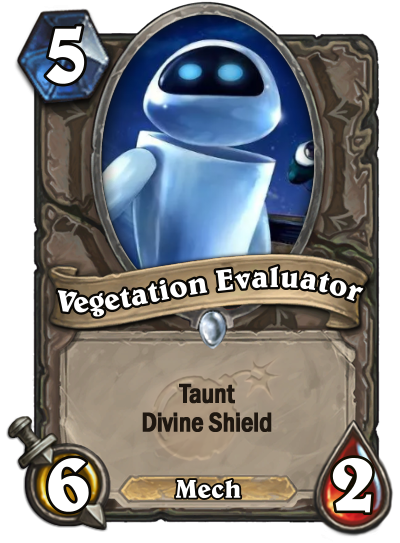 It will see a lot of play in mech decks in case aggro decks start dominating the meta. It took me like 15 minutes to find this dusty, dusty card, but I present to you: Felsoul Inquisitor 2, which is way better but I don't think earns the title of "Power Creeper". Not really. Felsoul Inquisitor didn't see play. This one isn't much better. If you run it you have to take advantage of it being a mech. Next set : Legendary E.V.A. This card was meant to be printed a soon as they announced the boomsday. Playable ?